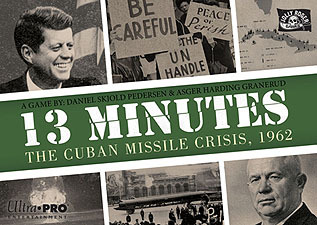 The world was never closer to global nuclear war than during the Cuban Missile Crisis in October 1962. Nuclear missiles launched from Cuba could reach Washington in a mere 13 minutes! Can YOU navigate this world of superpower brinkmanship without triggering World War Three? Inspired by the acclaimed game '13 Days', '13 Minutes' lets two players re-fight the crisis in a tense card game in - 13 minutes.